Classic G.I. Joe vol. 9 hits stores today! IDW continues its series of trade paperbacks collecting the original Marvel series with the release of vol #9. Completely re-colored and re-mastered, and collected into trade paperback for the first time! 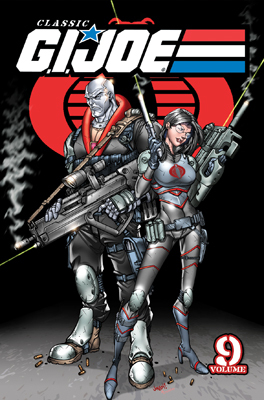 The adventures of America’s elite soldiers continue in issues #81–90 of G.I. JOE: A REAL AMERICAN HERO. Includes stories “Plots and Tracts,” “Roadpig,” “Assault on Castle Destro,” “Recurring Themes,” and more. I don’t know about most fans out there but I was ecstatic when IDW continued the reprints that Marvel started several years ago. Hopefully the series will sell well enough that I’ll be able to post that “Volume 15 has been released” in just a few years. Plus, that new cover kicks all sorts of snake tail! !